Most people have been told to be sure a veterinarian ONLY uses ISO on their pig, however, this is not usually possible. Because pigs are notoriously screamers, complainers, and squigglers when they do not like what you are doing (holding, injections, etc. ), they are most manageable to be held for inhalant anesthesia induction when they are still little. If a pig is over about 15-20 pounds (7-10 kg), certainly 30 pounds (12 kg), they are nearly impossible to restrain without injectable sedatives and anesthetics. Pigs react less predictably to these injectable medications than other veterinary species. Therefore, do not procrastinate in having your tiny little one surgically altered before the procedure becomes more complex, expensive, and risky. The technical term for going under anesthesia is “induction.” They are basically putting parts of the brain to sleep that are involved in motor function, pain perception, and consciousness. They aim to not stop autonomic functions like breathing and internal organ regulation. Going to far is called “too deep.” Of course, if a patient is not properly monitored and the anesthetic is not properly titrated (measured out to the desired effect for the individual patient), the brain could stop and the patient could die. One of the potential risks with injectable anesthesia is the finality of the dose. Once given, only some of the drugs can be reversed, many cannot. If a pig is unusually sensitive or reacts unpredictably to the drug, then damage or death could result. In veterinary medicine, they attempt to use reversible drugs for added options in case of an unpredictable reaction. Another technique they can use to give more options in case of anesthesia reactions is to titrate the dose. Certain intravenous injections and inhalant anesthetics can be given just enough to make the patient go right to the point of falling asleep (called “going under.”) Often times, when the first dose is given, some inexperienced vets will give another round because the first dose isn't as effective as they'd like it to be, however, knowing pigs, we know pigs resist loss of control and if given the opportunity and time to be calmed and relax, the first round of medications can be effective. Surgeons or vets in a rush will often give another round and this is where the problems occur. Using medications with no reversal agent doesn't leave any room for error. Please be sure your vet has experience with pigs and knows the appropriate doses and medications that can be safely used with regards to pigs. This can certianly be done discreetly and not in an inflammatory way. You can mention an article you read citing this link or one below to be sure they are aware of the dangers of using some of the medications that are commonly used in other species. Your pig should be awake, alert and starting to move around before you leave your vets office or they leave your home. Should your pig have a difficult time waking up from the particular cocktail they elected to give, having no professional help can lead to major problems. *Mini pigs do well with titrated inhalant anesthesia. ISO is a maintenance medication. 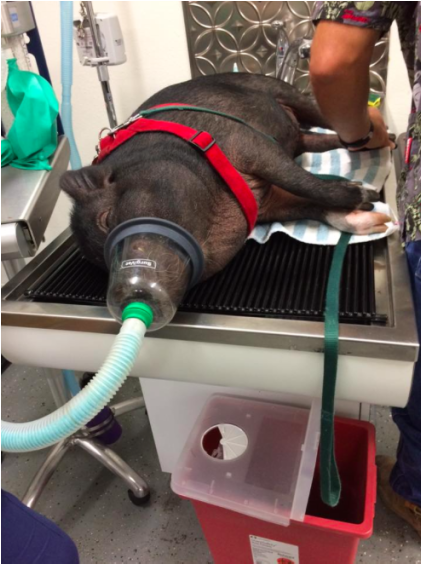 Trying to gas a panicked pig is nearly impossible, so typically, a mild sedative is also used to calm the pig prior to attempting to use ISO for sedation purposes. A porcine vet has written a guide for others below. 1. TKX (telazol/ketamine/xylazine) – 2.2 – 4.4 mg/kg IM, can use additional 2.2 mg/kg iv as needed (reconstitute telazol with 2.5 mg of ketamine (100mg/ml), and 2.5 ml of xylazine (100 mg/ml)). Isoflorane gas is by far the best anesthetic to use if available. It is often not available in the home. Buprenex is a marvelous pain reliever for pigs. 0.03 mg/kg (0.014 mg per pound) first dose, then 0.02 mg/kg (0.01 mg per pound) every 6-8 hours after that. Great for post-op pain, needed for about 3-4 days. Does not often cause constipation in the pig. given by squirting into the mouth. This can be formulated in tasty flavors. Banamine (aka flunixin) is also safe for pigs 1 mg/kg (0.45 mg per pound) orally or IM twice a day. Generally it's not recommend for any more than 3 days -- it can contribute to ulcers. Also, never mix with another anti inflammatory like aspirin, ibuprofen, etc., nor a steroid. Yes, these drugs should only be administered by a veterinarian or under the supervision of a veterinarian. You should ask your vet to Rx the buprenex and midazolam for you -- ONLY a vet should anesthetize with dexdomitor, telazol, ketamine, xylazine or isoflurane. Food should be withheld for 12-24 hours and water for at least 4hours. Stress caused by forceful physical restraint should be avoided. For this reason the intramuscular route of anesthesia is preferred. A two-inch needle is used for injection into the cervical part of the trapezius muscle. Other alternatives include using a 11/2 inch needle in the semimembranous and semitendinous muscles above the hock or the caudal part of the biceps femoral muscle. Intravenous induction of anesthesia is not recommended because of the lack of easily accessible veins. Once deep sedation /light anesthesia has been reached the level of anesthesia can be increased by using a facemask with 3-4% isoflurane preceded by administering oxygen through the mask at a rate of 3-4liters/min. for three to five minutes. The pig is then placed in sternal recumbency and masking continued until absence of jaw tone and muscle contraction in the back of the pharynx has stopped. This is important since potbellies have a small mouth that cannot be opened widely and a prominent tongue. The neck is thick and there can be a lot of fat accumulation in the pharyngeal region. This makes direct visualization of the larynx difficult and a laryngoscope with a long blade is necessary in order to depress the base of the tongue ventrally and the epiglottis cranially to expose the laryngeal opening. 2% lidocaine should be sprayed into the back of the throat to decrease the sensitivity of the larynx. Traumatic damage to the larynx can occur fairly easily particularly if a rigid stylet is used as a guide for endotracheal tube placement. Deaths have occurred due to laryngeal spasm, edema and even tracheal perforation following the use of a rigid stylet or inappropriate technique. Placement of the endotracheal tube with a plastic stylet to provide some rigidity is preferred. Once the endotracheal tube is though the larynx it is twisted through 900 to avoid the tip of the tube becoming trapped in a “pouch” in the ventral surface of the initial portion of the trachea. Once placed over inflation of the cuff should be avoided as this can damage the tracheal mucosa. Pigs should not be extubated until the swallowing reflex is present and a chewing motion has begun. Noisy respiration or sudden severe dyspnea indicates laryngeal spasm, edema, upper airway obstruction or pneumothorax. Re-intubation, tracheotomy or decompression of the pneumothorax may be necessary. Potbellies tend to become hypothermic during anesthesia and post-anesthetic temperatures in the 94-97 range are not uncommon. Maintenance of body temperatures during and after anesthesia is important. Halothane or isoflurane has not been reported as a cause of malignant hyperthermia in potbellies and recovery is usually smooth. Telazol (Fort Dodge) (tiletamine/zolazepam), ketamine and xylazine combination is often used for short procedures or to induce anesthesia before endotracheal intubation. However the dissociative effect of Telazol depending on the dose rate or repeat administration can be severe resulting in prolonged recovery characterized by continous paddling, thrashing and aimless wandering. Combination of xylazine (1-2mg/kg) and ketamine (9-15mg/kg) is preferred. With this combination recovery is usually smooth. The addition of Telazol adds unnecessary expense without any real benefit. For intravenous access the ear vein is preferred. A rubber tourniquet at the base of the ear will cause visible distention of the auricular vein in most cases. A 11/2 inch, 22 gauge catheter is placed and secured with stitches or super glue and taped over a roll of gauge placed on the inside of the pinna. Another vein, which can be accessed is the palmar venous arch just medial to the dew claw on the back of the leg. Accessing the cranial vena cava is difficult in potbellies because of their thick neck and prominent jowls. In some older females particularly those with uterine tumors the lateral thoracic vein can become clearly visible. Some clinicians regard a prominent lateral thoracic vein as being diagnostic for uterine tumor and results probably from interference with blood flow. Pigs should be handled, picked up or moved carefully while under anesthesia since rough handling or picking a heavy pig up by its legs may aggravate existing skeletal problems such as subclinical elbow arthritis. ​Occasionally a pig doesn't bounce back after being sedated, even days later. Most owners are worried when their pig has a change in behavior like this. Check with your vet if your pig is having difficultly returning to normal. Keep in mind the following information though. They may have injected the sedative into the fat pads rather than into his muscle. This is a very easy thing to do. When it happens, the pig does not get very sedate, so additional sedative is often given....into the fat pad. It takes hours for all of the sedative to hit the bloodstream and the result is often profound sedation for days. During this time, they often do not eat or drink, so dehydration can occur and this makes it take even longer for the sedative to wear off. During the sedation time, they are recumbent and develop painful muscles AND constipation and paralysis of the bowel is VERY COMMON. So...a pig needs liquids with electrolytes added to prevent salt poisoning...mix water and Gatorade or pedialyte, 50/50, and offer it frequently, but no more than 2 cups every hour. Canned pumpkin, 1 full can per day in 3-4 meals will help the bowel move. 1 tbsp fat, preferably animal fat, once a day for a week or so will also help. The pig may soil his bed or your house because he may not want to get up to go potty. He should be ok, but I would expect him to take up to 2 weeks to become completely normal. Mix his pellets with water also. Watermelon helps too. The University of California gives a great breakdown of meds used for pigs. A great link that explains sedation and anesthesia in detail is posted below. This is one parents experience with anesthesia. Remember, pigs can NOT regulate their body temperature after anesthesia, but tremors are fairly common as they're waking up. This is scary to watch though.